In simplicity comes elegance and I think that was Kathy Nielsen’s idea as she demonstrated how through children’s books we can teach adult lessons. This being one of Angie’s favorite books I would be afraid to assigning anything under a 3 for all areas of the Evaluating Multicultural Literature Rubric. It seemed to have a well developed plot (albeit not quite on par with War & Peace), Paul Owen Lewis seems like he comes from a place authority, there was a authenticity through the characters and setting, the dialog is relevant and the theme being universal is why I chose this book. Frog Girl is a story about how a little girl finds a frog civilization underneath a lake. 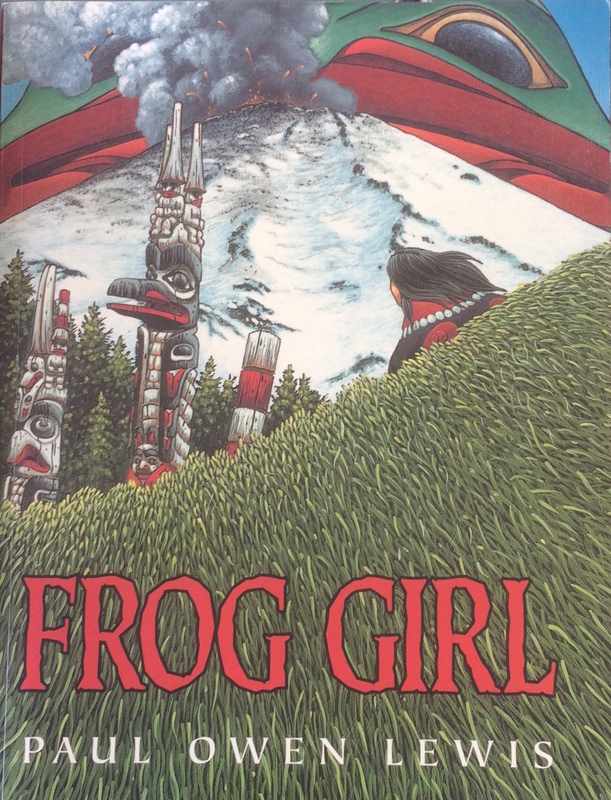 One of the elder frogs in that civilization is worried because she cannot find her children while under the threat of a large erupting Pacific Rim volcano. Frog girl finds them and rushes them all to safety. This story is applicable to a lesson covering the current 6th mass extinction period. I would apply the knowledge of the Tlingit people that only through having a respect for all beings and their habitat can we actually become stewards instead of exterminators. I would also use this to draw examples of how the lessons from many cultures can be adopted into our own to make our world a better place. Love that you are bringing in the theory regarding the 6th mass extinction event. This is a highly debatable subject that is not known but many outside of the science community. Seems like this good be a good way to approach the subject. Cheers, man. Interesting it looks like it could be tied into a lot of biology/ earth science lessons. The artwork is pretty darn amazing as well. I really liked your tie in to mass extinction, really tying the culture to science….I think I read that frog populations are dying out in certain areas- they are such a delicate animal that they are one of the first to be effected by environmental changes. That could also be a way to tie into Cultural Standard B by connecting a tale that has been long told with current issues.. I like how you were able to apply the story to an element that the larger populace may be able to relate to, such as extinction.